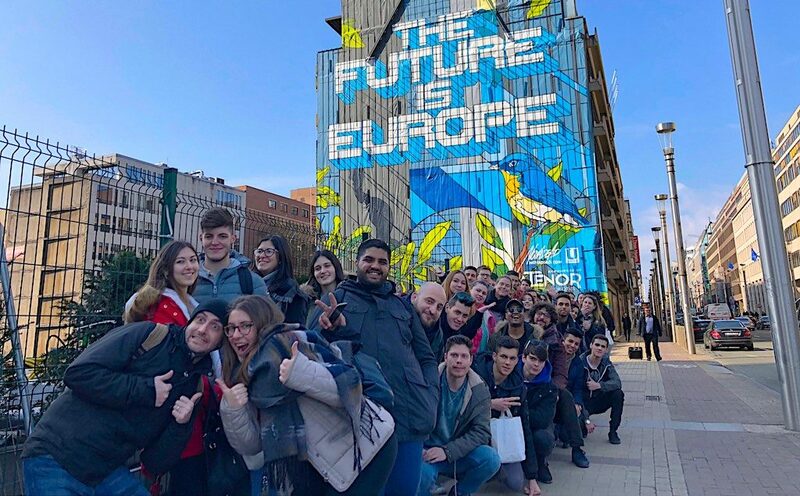 It was the highlight of the IBB project “Pimp my Europe”: More than 50 youths and young adults from Germany, Italy, and Hungary met in Brussels to organise a European youth conference. The participants have had an exciting week: International exchange, a behind-the-scenes look at European politics, but especially active discussions with Members of the European Parliament. For three days, the youths, in six working groups, intensively prepared their discussions with politicians: Educational policy, environment, employment policy, war and peace – these are just a few of the topics of burning importance for the active youths. Thus, for example Dennis Radtke, Member of the Committee for Employment and Social Affairs of the European Parliament, was confronted with the youth’s demands for overcoming youth unemployment. The Italian EU representative Brando Benifei answered questions on his work for an hour, while Rainer Wieland, Vice-President of the European Parliament, discussed international crises and the problem of arms exports with the conference participants. Jávor Benedek, Vice-Chair of the Committee for Environmental Questions, as well as Members of the European Parliament Tiemo Wölken and Jens Geier, were also available. The youths also discussed their demands for an expansion of programmes for European youth exchanges with Krisztina Hegedüs, assistant to the Hungarian MEP Péter Niedermüller. The participants all agreed that European politics has to become more transparent. Accordingly, they set an example and transmitted their conference as a live stream on the internet. During the other days of the conference, the youths evaluated the results of their previous meeting in Rome, and got to know Brussels and the European Parliament. The conference in Brussels was not just the highlight, but also the conclusion of “Pimp my Europe”. For two years, the IBB project provided a framework for the shared project work of youths, actively engaged for an inclusive and confident European citizenship. But the end of “Pimp my Europe” should inspire no sorrow, as its successor is already on the way: The International Association for Education and Exchange is initiating a new funding programme entitled “Generation Europe”, building on the experiences of “Pimp my Europe”. With project partners in 14 European countries, the new programme will enable the participation of a significantly greater number of youths. We are looking forward in excitement. Further information will be published by IBB soon.